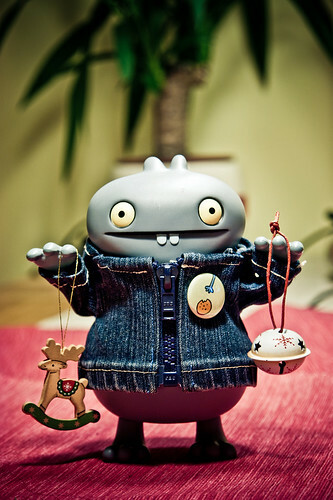 Uglyworld #1331 - Xmas Goodies Gatherererings (Project BIG - Image 314-365), a photo by www.bazpics.com on Flickr. I realisereds today that we is now justs over a monther untils it's timers for fathers christmaser and his little elfies to brings all the gooders kiddies lots of presenters, and withs this going to be our firsters christmaser liverings in the cookie cave I wanteds to makers it a littlers bit specialer! Looks what I findereds in a shopper in the city todays, some super coolers decomarations to hangers on our firsters christmaser tree, Mireille will be overs the mooner with my selectioners!